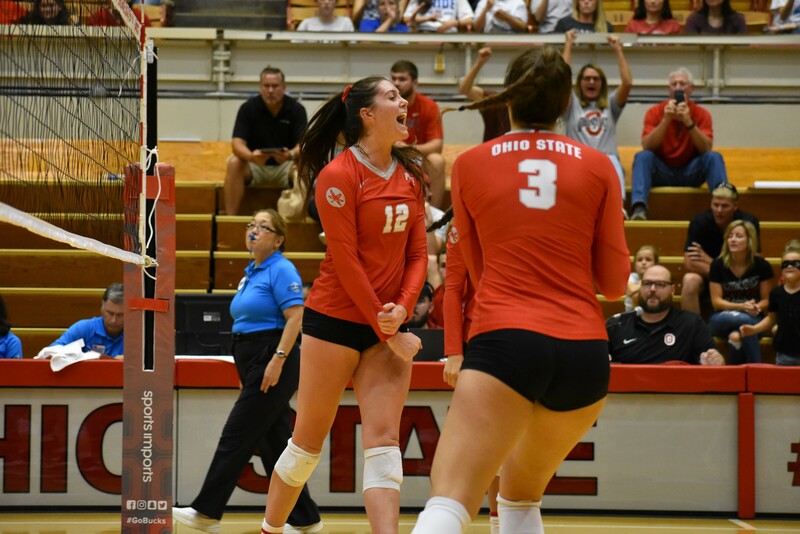 COLUMBUS, Ohio – The Ohio State women’s volleyball team began its 2018 season in front of Buckeye Nation inside St. John Arena with a 3-1 win (25-17, 21-25, 25-16, 25-13) over Albany on opening day of the Sports Imports D.C. Koehl Classic. Sophomore Lauren Witte was on fire, attacking at a .621 clip on her way to a career-high 19 kills and 20.5 points. Freshman Vanja Bukilić tallied 11 kills, three service aces and three block assists. Newcomers Adria Powell (8), Mia Grunze (7) and Jordan Fry (6) rounded out the kills while Olivia Dailey chipped in 50 assists. Camry Halm had 17 digs, followed by Grunze and Dailey with 12 apiece. As a team, Ohio State recorded eight blocks, 10 aces and held the Great Danes to a .094 attack percentage. SET 1: The Buckeyes quickly doubled up on the Great Danes, 10-5, to begin the match. Albany pulled within two, 18-16, but Grunze gave the home team some separation on a kill and service ace. Ohio State scored the last five points to take the opening set, 25-17. SET 2: It was a back and forth battle all the way through. It wasn’t until late in the action that Albany began to get some breathing room with a 22-19 lead. Ohio State called a timeout to regroup but the Great Danes held on for a 25-21 triumph. SET 3: Albany needed to burn a timeout early after OSU scored seven unanswered points. The Great Danes used their final timeout as the Buckeyes went up 15-7. Ohio State kept the kills coming to claim the set, 25-16. SET 4: Ohio State quickly went ahead 7-1 to send the visitors to their bench. The Buckeyes kept pounding away as they jumped out to a 20-10 advantage before securing the match on a kill from Bia Franklin, 25-13. Ohio State returns to St. John Arena for a pair of matches on Saturday. The Buckeyes will face in-state foe Ohio at 12:30 p.m. before wrapping up the tournament at 8 p.m. against Texas A&M.